Cary, NC – Lately, many nationwide chains have come to Cary to capitalize on the vibrant community that’s here. But North Carolina originals are also setting their sights on Cary, with Dame’s Chicken and Waffles opening a new store in town. 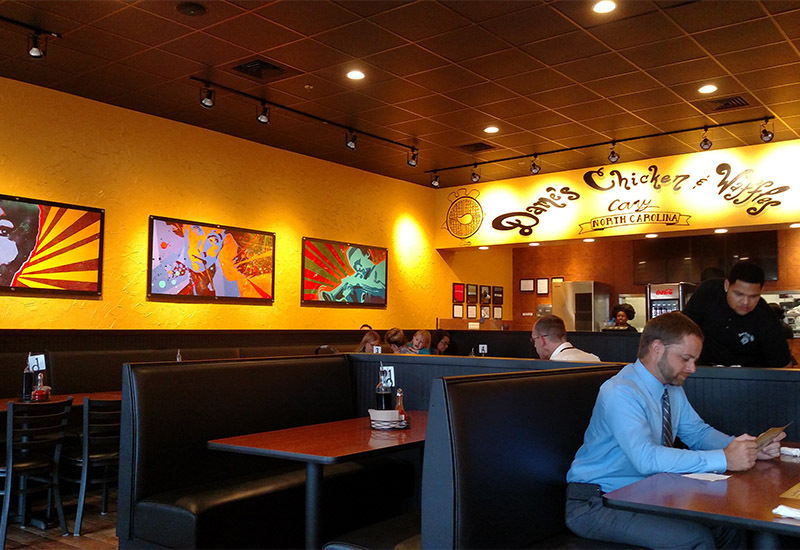 Dame’s Chicken and Waffles opened in Cary on Tuesday, November 1, 2016 on North Harrison Avenue. Dame’s already has long-time locations in Durham and Greensboro, and co-owner and manager Michael Newell said word of the restaurant had spread to Cary, making it a promising spot for a new location. Newell also said it’s an accessible location because he lives nearby and founder and owner Damion “Dame” Moore lives close enough that he sometimes works in the Cary store’s kitchen. Newell and Moore are part of what he described as a four-man team that are involved in the beginning of Dame’s, with Moore and Randy Wadsworth starting the first one in Durham and Andre Towns working as general manager for the Greensboro store. Newell himself worked as the chain’s attorney. 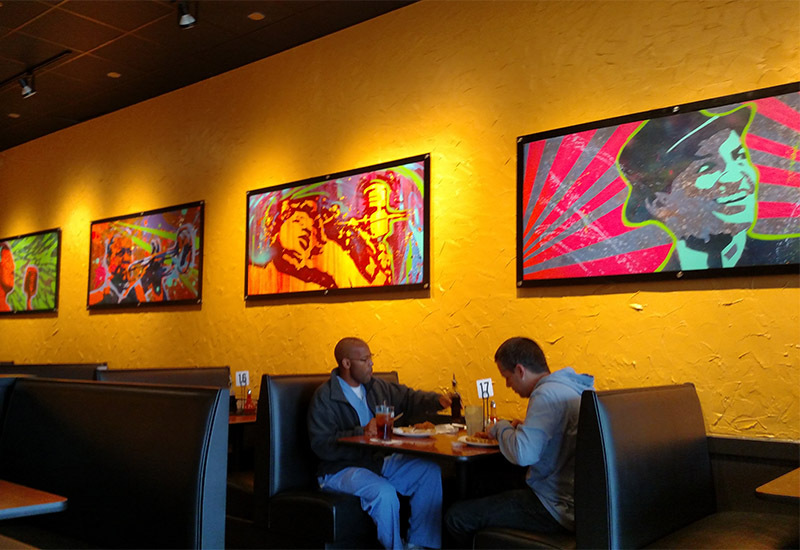 The space for the Cary Dame’s was redone to reflect their intended atmosphere, with the walls painted a warmer color, Edison lightbulbs installed to give a cool feel and art up on the walls of jazz and soul music greats. The walls also have art from local students and other community artists, with more to come. Pairing fried chicken and waffles is a culinary tradition in the South that stretches back to the 18th Century. But since Cary has many residents who moved from other parts of the country and the world, not everyone may be familiar with the dish. “It’s that mix of sweet and savory tastes. There aren’t a lot of ways you can get that combination,” Newell said. Newell said while people may think they are used to chicken and waffles, Dame’s has found a way to differentiate itself with lots of variety. For example, there are sweet potato waffles, gingerbread waffles and vegan waffles. “People think we just put a vegan waffle on there as an option but it’s tasty,” he said, adding that he likes to pair their grilled chicken with the vegan waffle. Speaking of grilled chicken, Dame’s offers many different types of chicken than the typical fried chicken in chicken and waffles. Newell said they have everything from wings to cutlets and these can all be mixed and matched with different types of waffles. “Variety in pairing is a big point here,” he said. And to go with these waffles, Newell said Dame’s also has their own line of signature “shmears,” which are créme buttters that come in many different flavors and are prepared with fresh ingredients. “People may think it’s just fried chicken here but we have a lot to offer,” he said. Dame’s Chicken and Waffles is located on 1823 N Harrison Ave.